We are excited that our next set of community announcements will have a completely different look because we are switching to Mailchimp to format them! Besides the visual improvements we will also be able to offer a variety of lists to be on, allowing for a more targeted experience. As an example, one of those lists will be jobs/trainings. If you just want to receive that type of info then you will be able to select that list to be on. Another great feature is the unsubscribing function. Occasionally we get requests to be removed from our announcements and with Mailchimp it will happen easier and quicker. Watch for the next set of announcements and we hope you like it! It’s almost time for our Pow wow! Saturday, August 25th, public welcome from 11am to 4pm, at our annual pow wow and health fair! We will have Native American arts and crafts, as well as food available for purchase. The grand entry of dancers will begin at noon! This is a free event and we are recommending you bring your lawn chairs so you’ll be able to watch all the dancing in comfort. Our pow wow will be at Romanowski Park, 4551 Lonyo Ave., Detroit, which is right around the corner from our agency. We are open to all dancers. We will also have a Wellness Walk around Romanowski Park at 10:30am. Wellness Walk participants will receive a t-shirt. Registration for the walk begins at 10am. For pow wow vendor information, contact Casey Brant at cbrant@aihfs.org This is a drug and alcohol free event. For general information please call Shelly at 313-846-3718. We are looking for a bunch of help for Saturday August 25th, from approximately 9am-6:30pm for our annual powwow and health fair that celebrates and promotes wellness in the community. We will need the most help during set up and clean up, but also have roles throughout the day that we could use support on. If you are able to volunteer, please contact Bridie at email: bjohnson@aihfs.org or ph (313)846-3718. Sunday, August 26th, we are having a community sweat lodge here at AIHFS, 4880 Lawndale, Detroit. The conductor will be Tony Davis of the Little Traverse Bay Band of Odawa Indians. Fire & Teachings start around 10am. We will go in around 12pm (noon). Please remember these times are approximate. Women should bring a long comfortable skirt, modest comfortable top (such as a t-shirt) and a towel. Men should bring shorts and a towel. If you would like to bring a dish to share for the small feast afterwards, please do! For more info, 313-846-3718. AIHFS will be closed Monday, September 3rd, in recognition of Labor Day. All regular business will resume Tuesday, September 4th. Please plan accordingly. 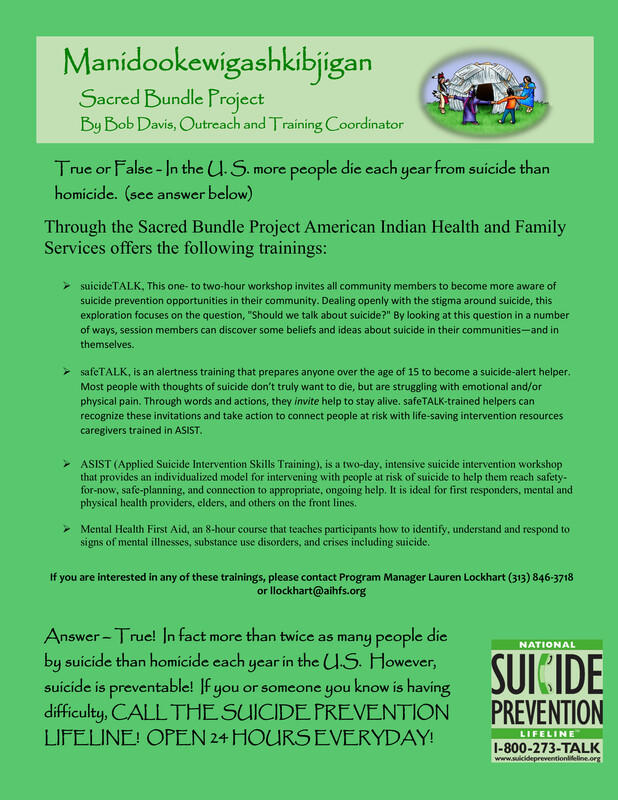 September 6th, here at AIHFS, Sacred Bundle is offering a free training designed to teach parents, family members, human services workers and others, how to help an adolescent (age 12-18) who is experiencing a mental health or addictions challenge, or is in crisis. Please let us know if you are attending, LLockhart@aihfs.org or ph. 313-846-3718. 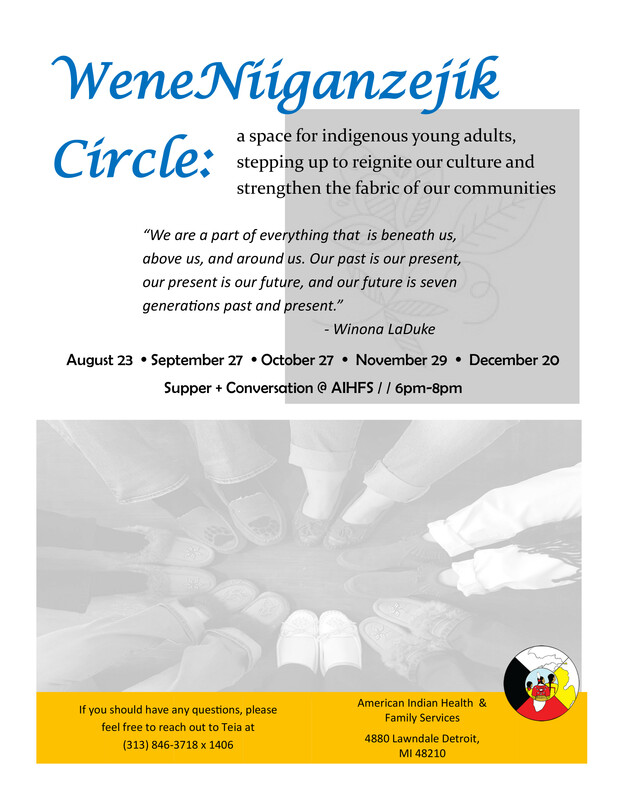 Our WeneNiiganzejik Circle meets next Thursday, August 23rd, from 6pm-8pm at AIHFS. This group is for young adults who are looking to connect, share, and grow together. We also seek to reignite our indigenous culture and strengthen the relationships we have with each other. For more info, Teia at 313-846-3718. Additional meeting dates are on this flier. Saturday, August 25th, public welcome from 11am to 4pm, at our annual pow wow and health fair! We will have Native American arts and crafts, as well as food available for purchase. The grand entry of dancers will begin at noon! This is a free event and we are recommending you bring your lawn chairs so you’ll be able to watch all the dancing in comfort. 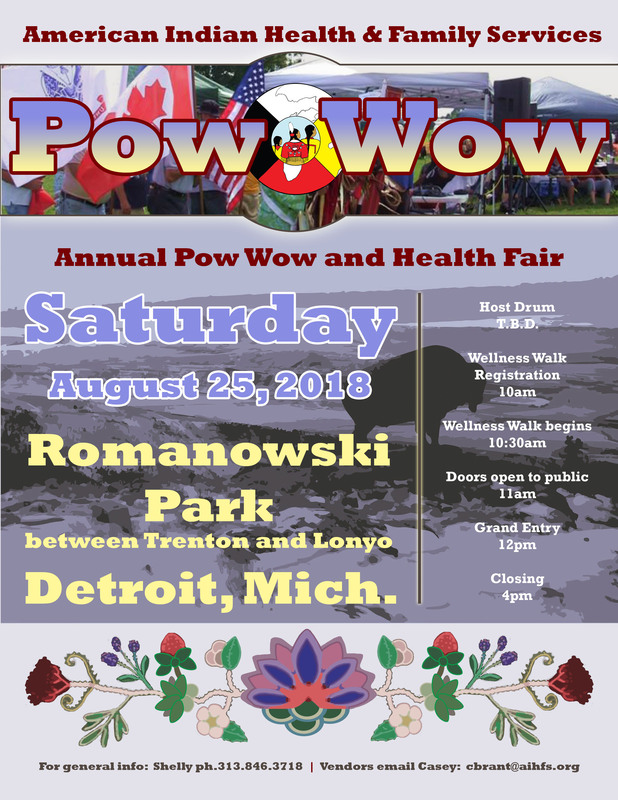 Our pow wow will be at Romanowski Park, 4551 Lonyo Ave., Detroit, which is right around the corner from our agency. We are open to all dancers. We will also have a Wellness Walk around Romanowski Park at 10:30am. Wellness Walk participants will receive a t-shirt. Registration for the walk begins at 10am. For pow wow vendor information, contact Casey Brant at cbrant@aihfs.org This is a drug and alcohol free event. For general information please call Shelly at 313-846-3718. The flier is at last week’s announcements. 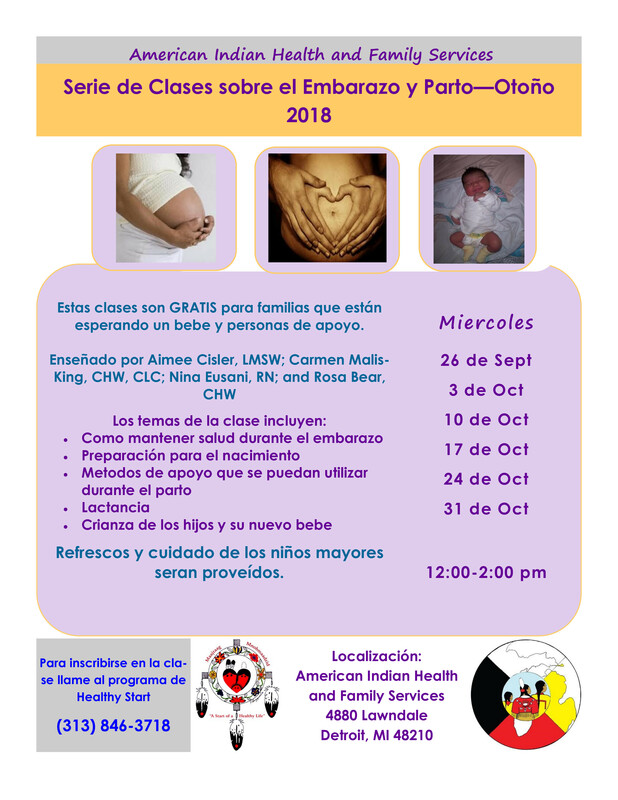 These classes are FREE for expecting parents and their partners and support people! 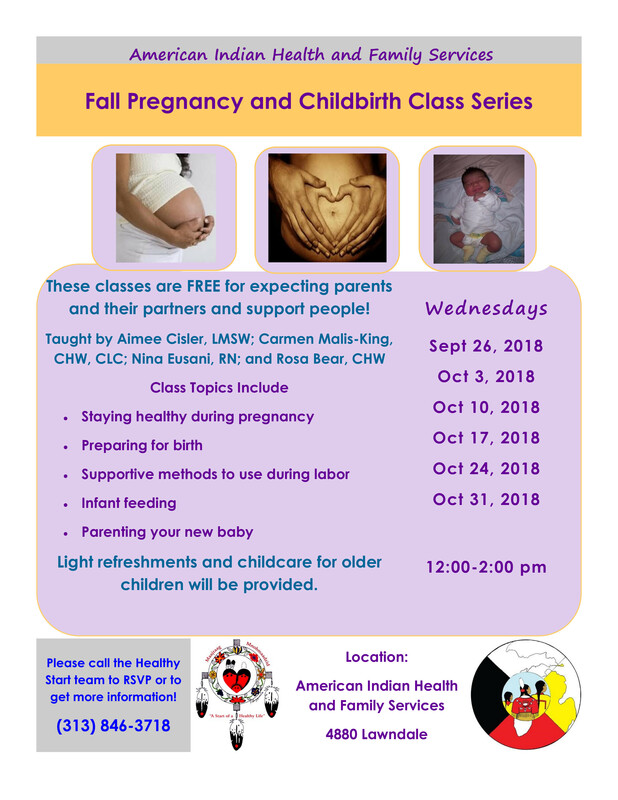 This is a 6-week series and classes run every Wednesday from 12-2, starting September 26, 2018. Topics include: staying healthy during pregnancy, preparing for birth, infant feeding, and parenting new babies. Light refreshments and childcare are provided each week. Classes are available to both English and Spanish speakers. 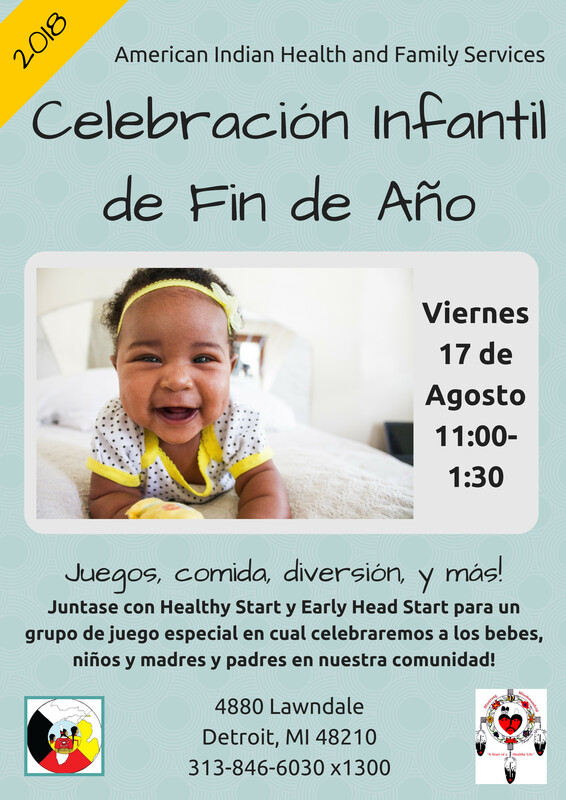 Please call the Healthy Start team to RSVP or to get more information: (313)846-3718. Join us in supporting The Sacred Roots team. They have been selected as delegates this year to represent AIHFS, Slow Food Detroit and Turtle Island at this year’s Terra Madre Salone de Gusto in Turin, Italy. They would greatly appreciate it if you were able to support them by purchasing a t-shirt or by making a donation to their travel fund. Shirts will be available for sale during our Powwow on August 25th. We can accept cash, check and credit cards. If you would like to pre-order, please contact Rosebud – rschneider@aihfs.org or 313-846-3718. Members of Starfish Family Services did a wonderful job representing the Thrive by Five Detroit collaborative while on Click on Detroit! American Indian Health & Family Services is a part of this collaborative. 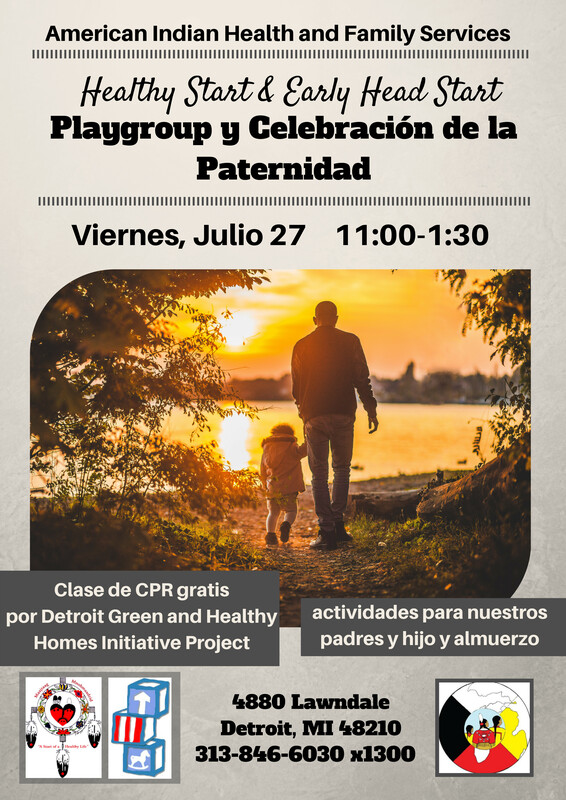 In 4 short minutes they were able to increase our footprint in the city of Detroit, recruit for both children and teachers, as well as give parents an activity to do at home with their children. Use the following link to watch the segment. AIHFS’ Sacred Roots has been nominated for a Food Power Award through the Detroit Food Policy Council. Each year the Detroit Food Policy Council hosts the Food Power Awards to celebrate those doing powerful work to build a sustainable and just local food system in Detroit. If you’d like to vote for them, use the following link. On August 16th! ILEAD & Sarah Dayson have invited Women’s Society to participate in a beading workshop in the social hall of AIHFS, 5-7pm. Please note the workshop starts a bit earlier than the usual time. Come get your bead on! 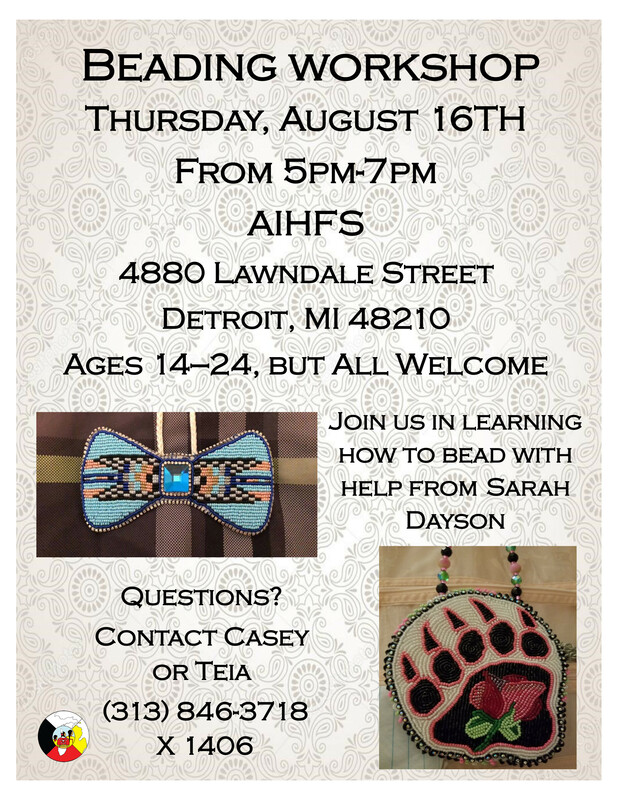 On Thursday, August 16th from 5pm-7pm, AIHFS is hosting a beading workshop with Sarah Dayson. All are welcome to attend, whether it’s your first time or if you are looking to improve your skills! If you have questions, call Casey or Teia at 313-846-3718. Saturday, August 25th, public welcome from 11am to 4pm, at our annual pow wow and health fair! We will have Native American arts and crafts, as well as food available for purchase. The grand entry of dancers will begin at noon! This is a free event and we are recommending you bring your lawn chairs so you’ll be able to watch all the dancing in comfort. Our pow wow will be at Romanowski Park, 4551 Lonyo Ave., Detroit, which is right around the corner from our agency. We are open to all dancers. We will also have a Wellness Walk around Romanowski Park at 10:30am. Wellness Walk participants will receive a t-shirt. Registration for the walk begins at 10am. For pow wow vendor information, contact Casey Brant at cbrant@aihfs.org This is a drug and alcohol free event. For general information please call Shelly at 313-846-3718. We also have opportunity to help as a volunteer, for more info ask for Bridie at the same ph. number. 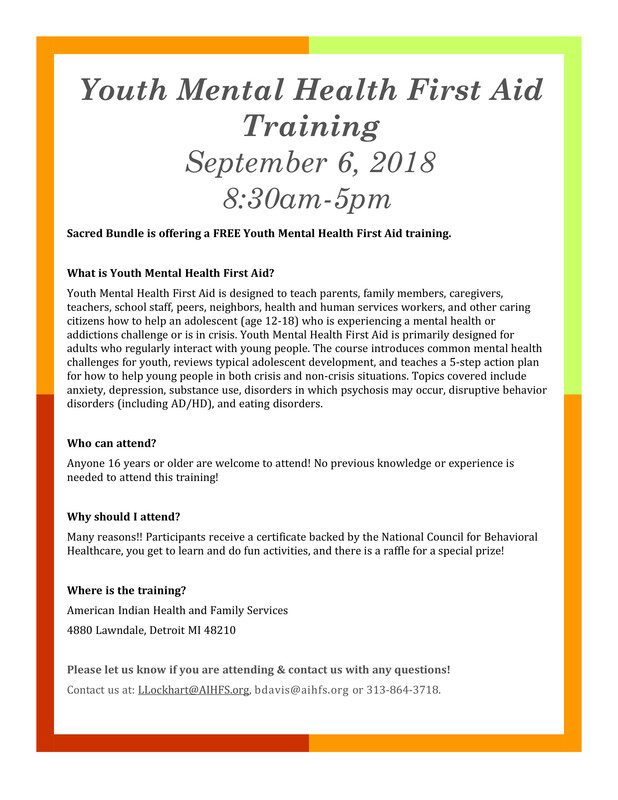 September 6th, here at AIHFS, Sacred Bundle is offering a free training designed to teach parents, family members, human services workers and others, how to help an adolescent (age 12-18) who is experiencing a mental health or addictions challenge, or is in crisis. Please let us know if you are attending, LLockhart@aihfs.org or bdavis@aihfs.org or ph. 313-846-3718. 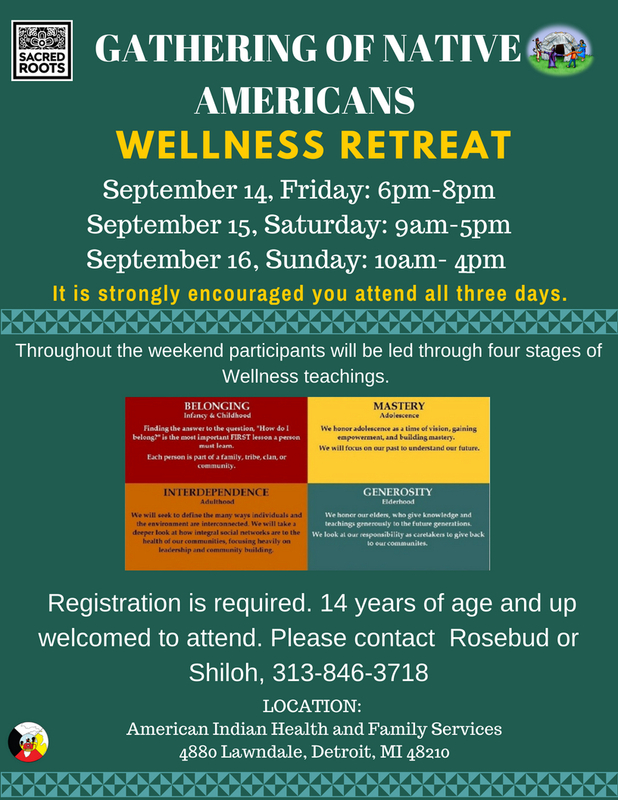 Sacred Roots and Sacred Bundle will be hosting a Wellness Retreat on September 14-16. We welcome anyone 14 and up to attend. Registration is required. Please contact Rosebud or Shiloh to register or if you have questions. rschneider@aihfs.org or smaples@aihfs.org. 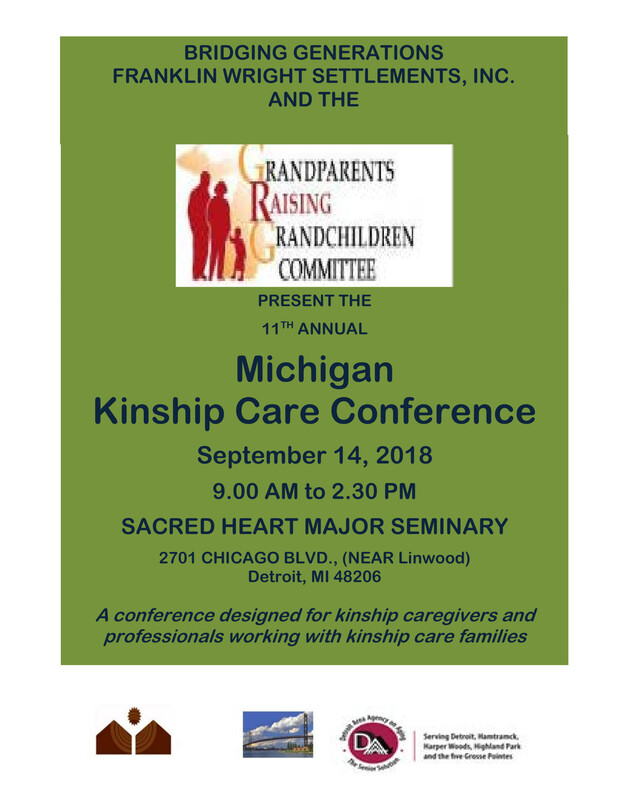 The Detroit Area Agency on Aging along with its partners, Bridging Generations and Franklin Wright Settlements will host a Statewide Grandparents Raising Grandchildren Conference Friday, September 14, 2018 from 9.00 a.m. to 2.30 p.m. at Sacred Heart Major Seminary on Chicago Blvd. in Detroit. Attendance is FREE for grandparents and kinship relatives. 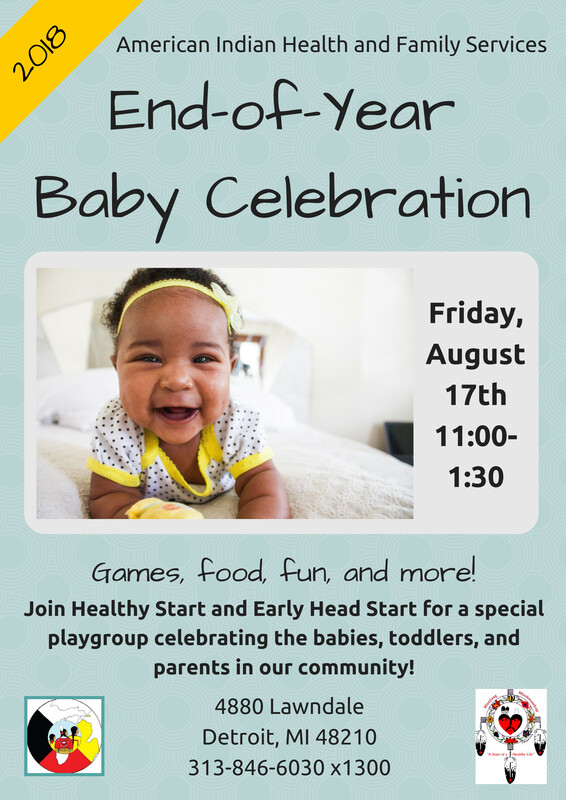 Fatherhood Celebration and Playgroup this Friday! 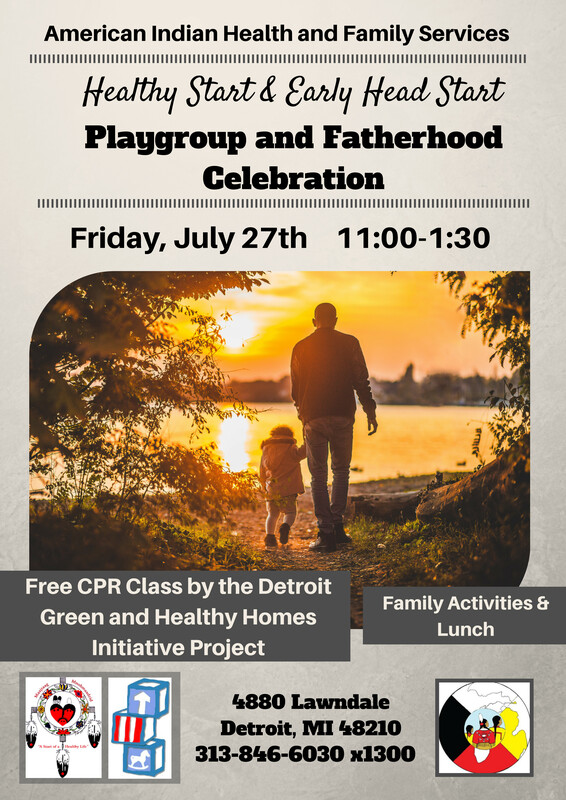 Healthy Start and Early Head Start are hosting a special playgroup encouraging more of our dad’s to come this Friday, July 27th, 2018 from 11:00-1:30 p.m. We will be providing some lunch and a CPR Presentation by the Detroit Green and Healthy Homes Initiative. All parents and caregivers are welcome to come and bring their young children to play and learn. 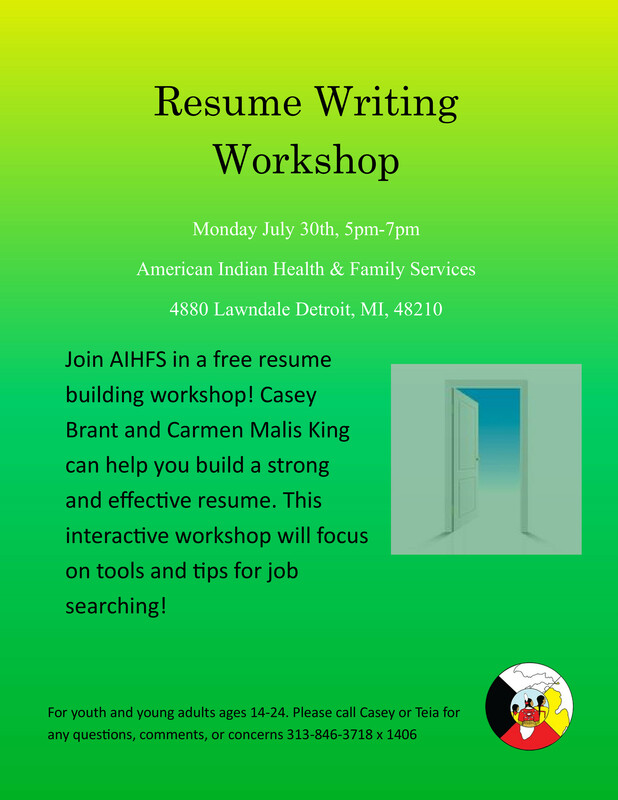 Join AIHFS in a free resume building workshop on July 30th from 5pm-7pm! Casey Brant and Carmen Malis King can help you build a strong and effective resume. This interactive workshop will focus on tools and tips for job searching! 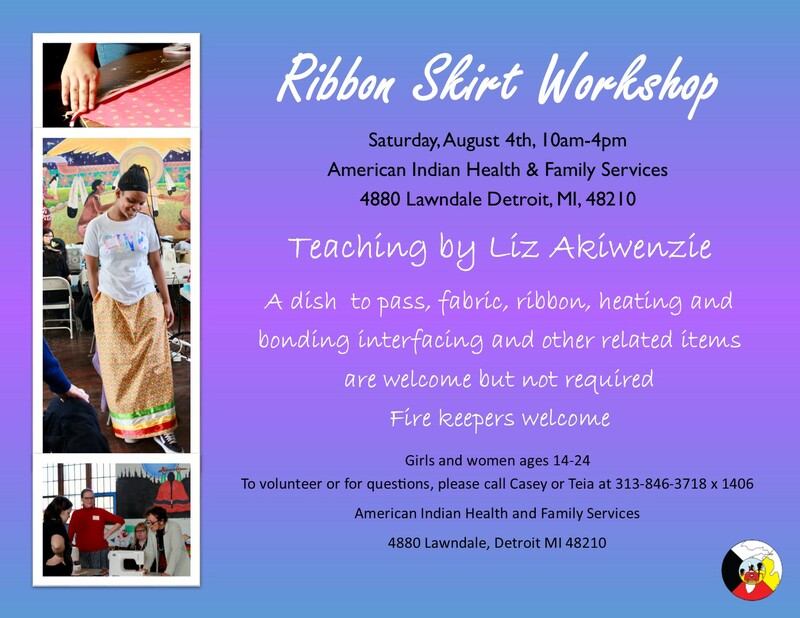 On August 4th, we’ll be hosting a Ribbon Skirt Workshop at AIHFS. All are welcome to participate in the workshop, though we’re mostly looking to engage young women ages 14-24. We’re also looking for volunteers/mentors to help guide our newer crafters along their journey of sewing! Please call Casey or Teia at 313-846-3718 x 1406 to volunteer or register! 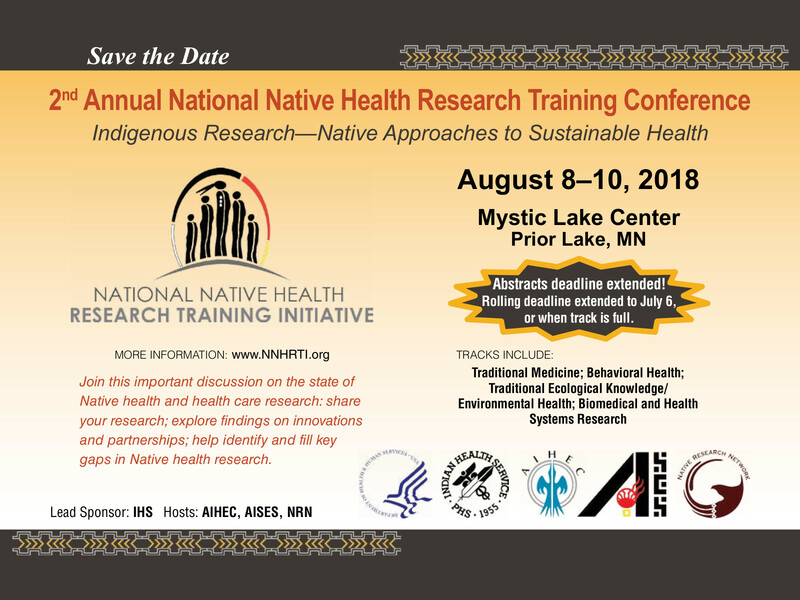 August 8th-10th, at the Mystic Lake Center, Prior, MN join this discussion on the state of Native health and health care research. Tracks include: traditional medicine, behavioral health, traditional ecological knowledge, biomedical and health systems research. 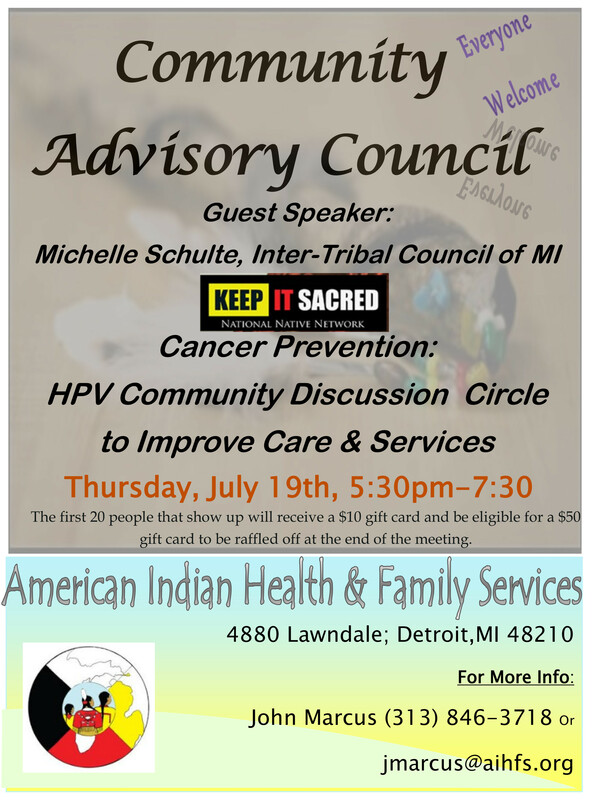 Thursday, July 19th, 5:30pm-7:30pm, everyone is welcome to attend a community discussion here at AIHFS on Human Papillomavirus (HPV) led by Michelle Schulte of Inter-Tribal Council of Mi. Don’t forget, the first 20 people get a $10 gift card and will be eligible for a $50 gift card to be raffled off that night. Here are links to 2 great articles shedding some light on AI/AN maternal and infant mortality. The Healthy Start program here at AIHFS is also a part these articles! Saturday, August 25th, 12pm to 4pm, we will have our annual pow wow and health fair! We will have Native American arts and crafts, as well as food available for purchase. The pow wow will be open to the public beginning at 11am. This is a free event and we are recommending you bring your lawn chairs so you’ll be able to watch all the dancing in comfort. This year’s pow wow will be at Romanowski Park which is right around the corner from our agency. We are open to all dancers. We will also have a Wellness Walk around Romanowski Park at 10:30am. Registration for the walk begins at 10am. For pow wow vendor information, contact Casey Brant at cbrant@aihfs.org This is a drug and alcohol free event. For general information please call Shelly at 313-846-3718. AIHFS will be closed Wednesday, July 4th, in observance of Independence day. This also means there will not be Wellbriety, Women’s Society, or Men’s Society that day. 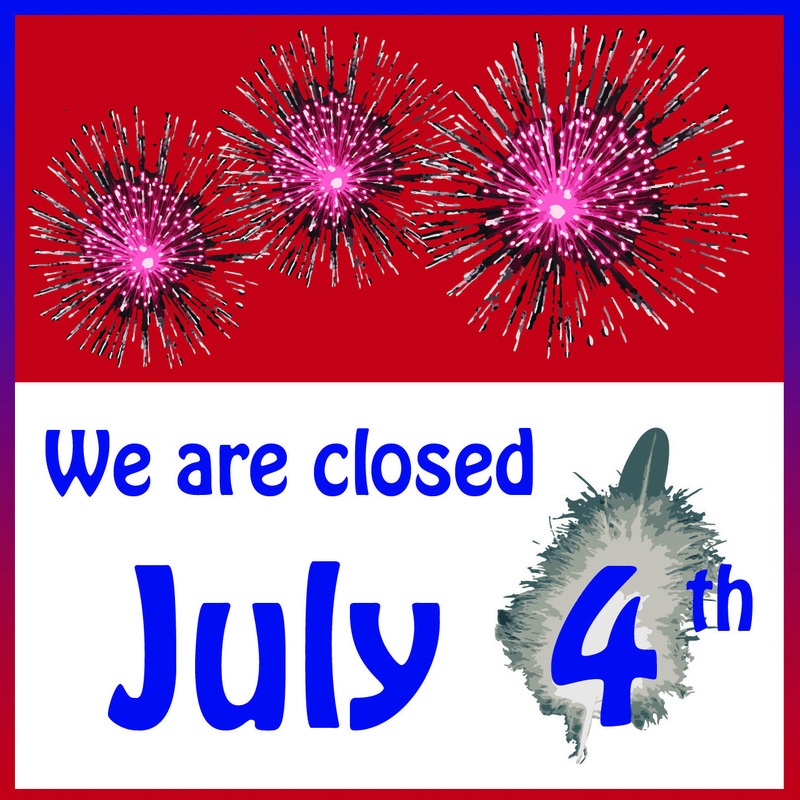 We will resume all regular business the following day, Thursday, July 5th. Please plan accordingly. True or False, in the U.S. more people die each year from suicide than homicide? Find the answer to this question and more below! 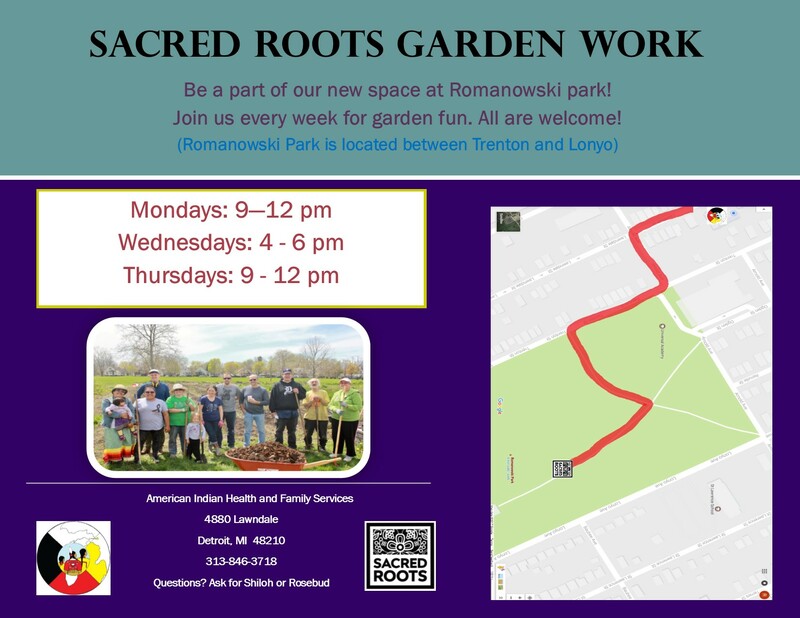 Join Sacred Roots every week for garden fun at their new space at Romanowski park. They meet Mondays and Thursdays from 9am-12pm, and Wednesdays from 4pm -6pm. For more info ask Shiloh or Rosebud at 313-846-3718. The Michigan Indian Family Olympics will take place on Friday July 20th, 2018 at Central Michigan University’s Bennett Track and Field in Mt. Pleasant, Michigan. The Olympics brings together native people from all over the state for a day filled with fun, community, and health and wellness. Join our Detroit team! Transportation will be provided along with an AIHFS team t-shirt! Please email tmcgahey@aihfs.org to reserve your spot TODAY! 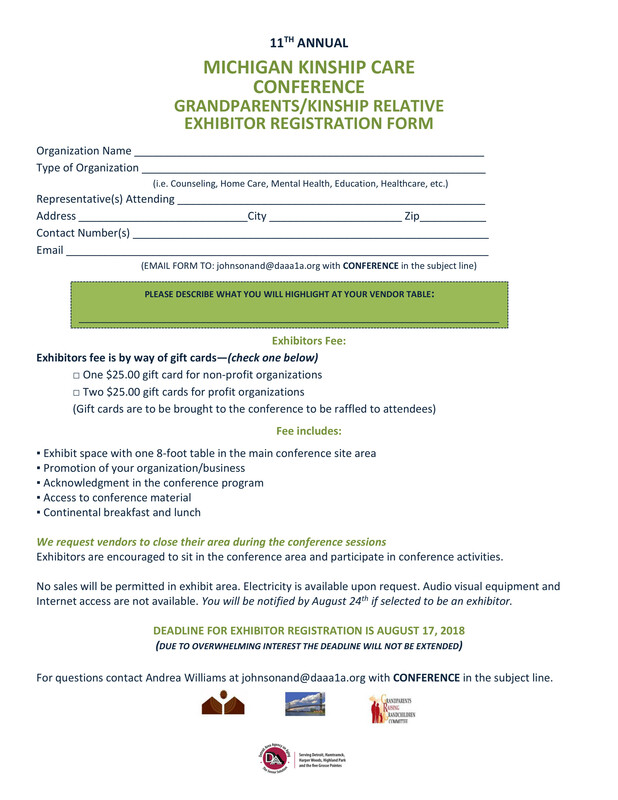 The Detroit Wayne Mental Health Authority (DWMHA) is hosting its 4th Annual Faith Based Initiatives Conference and would like you and/or your organization to participate. 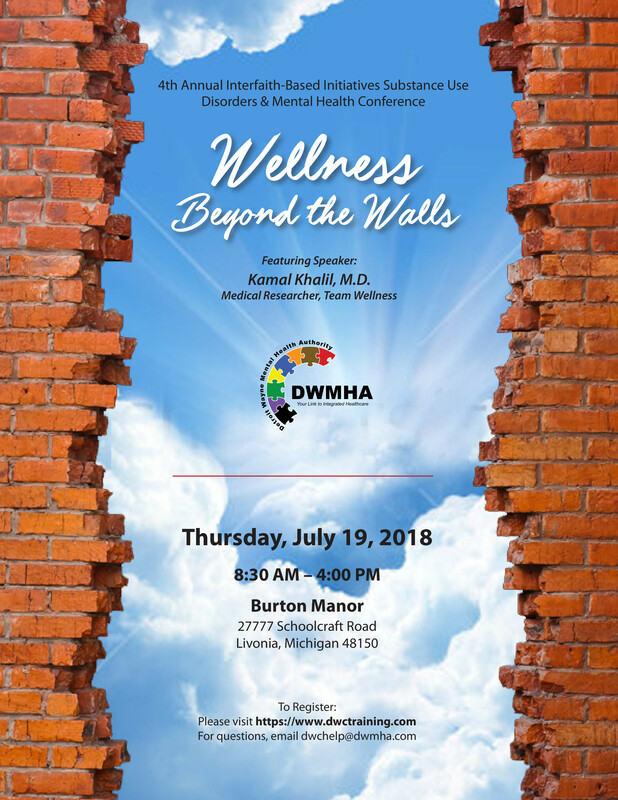 Here is the flyer and link to register for the 4th Annual Inter-Faith Based Initiatives Wellness Beyond the Walls Conference: Connecting Community, Spirituality & Wellness: Chasing Circumstances or Changing Conditions to be held Thursday, July 19, 2018 from 8:00am-4pm at Burton Manor, 27775 Schoolcraft, Livonia 48150. 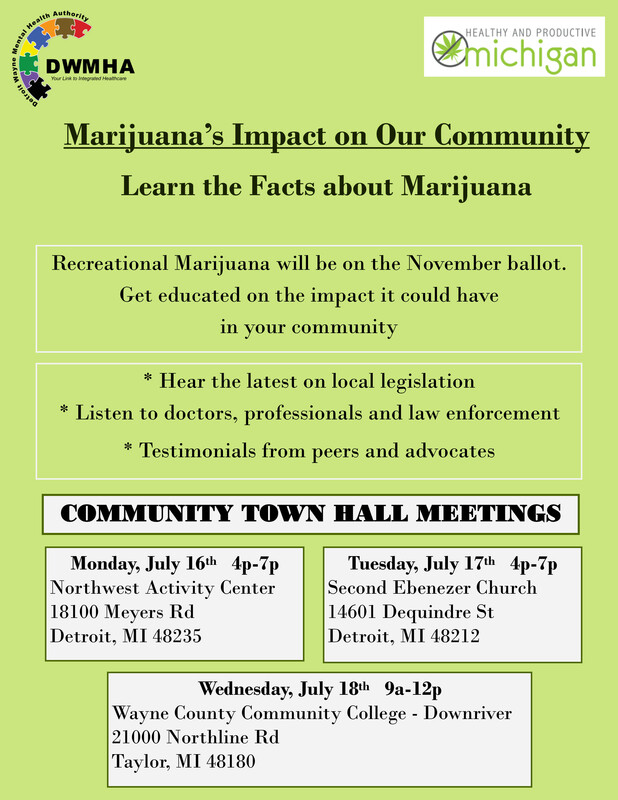 Come learn the facts about marijuana. The DWMHA is sponsoring a series of community town hall meetings Monday, July 16th through Wednesday, July 18th. The AIHFS I-LEAD team has summer apprenticeship opportunities available to native young adults ages 14-24. These apprenticeships seek to provide opportunities for professional development, cultural connection, the exploration of identity, the finding of purpose, and developing clarity around one’s path in life. They will also help build leadership skills and a sense of comradery among other program participants through weekly team meetings. This program is intended to provide skills so that our people become more empowered to follow their paths while using their unique passions and gifts. . For more info, use this link to our employment webpage. The AIHFS I-LEAD team has two positions available for native young adults to serve as mentors to our community. Our peer mentors will support other youth in the community in regards to employment, education, cultural connection, and leadership development. The peer mentors will assist with workshops, conduct one-on-one visits with other youth, and serve as an integral part of the implementation team. They will work directly with staff to assist with activities such as outreach/awareness, community events, partnership building, trainings, and data entry. For more info, use this link to our employment webpage. June 28th, 12 – 1pm, at Sacred Heart Church, 1000 Elliot st, Detroit. 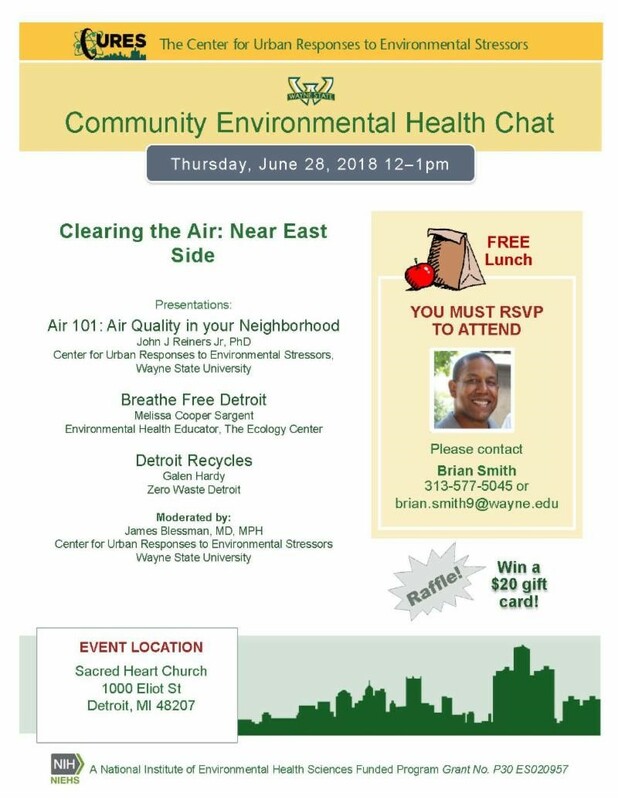 The Center for Urban Responses to Environmental Stressors is sponsoring a community environmental health chat. RSVP to attend. Please contact Brian Smith, 313-577-5045. The Michigan Indian Family Olympics will take place on Friday, July 20th, 2018 at Central Michigan University’s Bennett Track and Field in Mt. Pleasant, Michigan. The Olympics brings together native people from all over the state for a day filled with fun, community, and health and wellness. Join our Detroit team! Transportation will be provided along with an AIHFS team t-shirt! Please email tmcgahey@aihfs.org to reserve your spot TODAY! The click this 2-sided pdf to see the flier. July 19th, 5:30pm-7:30pm, everyone is welcome to attend a community discussion here at AIHFS on Human Papillomavirus (HPV) led by Michelle Schulte of Inter-Tribal Council of Mi. 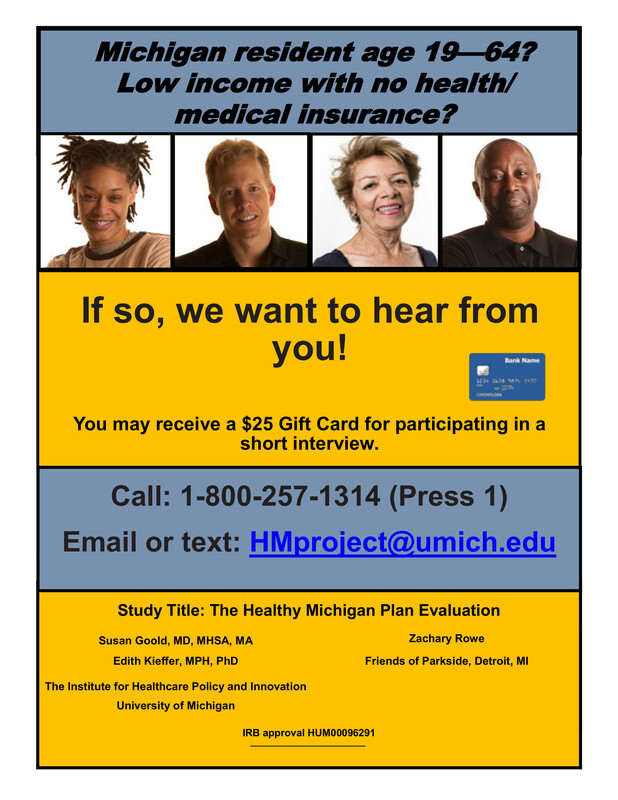 Are you a Michigan resident age 19 – 64 with low income and no health insurance/medical insurance? If so you may be eligible for a $25 gift card.